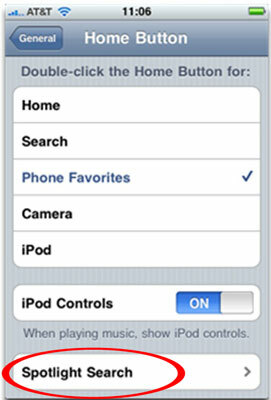 By using your iPhone, with its iPod app, you can find a song by its title and play that song. Tap the Songs icon at the bottom of the iPhone’s iPod screen, and a list of songs appears. Flick upward or downward to scroll. Enter the title (or part of the title) in the search field at the top of the list, and then tap the Search button. Tap a little letter on the right side of the screen to go to song titles that start with that letter. Those letters are extremely small, so unless you have tiny fingers, you may have to settle for a letter close to the one you want or else tap several times until you select the correct one. If you’re not sure which song you want to listen to, try this: Tap the shuffle button at the top of the list between the search field and the first song title. Your iPhone will now play songs from your music library at random. To access Spotlight, flick to the left of the main Home screen (or press the Home button from the Home screen). In the bar at the top of the screen that slides into view, enter your search query. The iPhone starts spitting out results the moment you type a single character, and the list narrows when you type additional characters. The results are pretty darn thorough. Say you entered Bell as your search term. 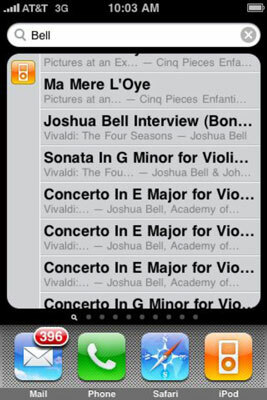 If your iTunes library has the song “One Last Bell to Answer” or music performed by violinist Joshua Bell, those show up, along with any contacts, companies, or apps that have Bell in them somewhere.